Ranthambhore| Two very small new-born tiger cubs were spotted with their mother, Arrow-Head aka T-84 in Ranthambhore Tiger Reserve, situated in Sawai Madhopur district of Rajasthan. Today in the evening drive, the Queen of Ranthambhore, Arrow-Head was spotted with her two small cubs in zone no. 2.The tigress, T-84 was sighted with her 2 cubs near Parni-water hole in Nal Ghati area while she was feeding her the new born baby. It is the first litter of Arrow-Head. The new born cubs should be around two or three weeks only but is really very hard to assume the age of these cubs because they are too small. I think that I have never ever heard of any tiger showing her cubs at such an early age. Arrow-Head aka T-84 is the dominant tigress of Ranthambhore who roams frequently in zone no. 3, 4, 5 and some part of zone no.1 and 2 also. 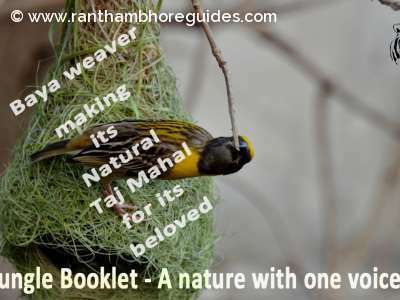 She is queen of Ranthambhore because she has occupied best tiger habitat area around 3 lakes in the tiger reserve. She occupied this area from her mother Krishna aka T-19. She is quite young tigress, around four years old plus. She is from second litter of Krishna (T-19), sighted first time on date 23 March, 2014 while her mother, Krishna was shifting her cubs by holding them in her mouth by her canines one by one. In her second litter, Krishna gave birth 3 cubs, two females’ cubs and one male cub. One is called Lighting & other is Packman from this litter. Arrow head has succeeded the territory with hard struggle. If everything goes well, the glory of zone 03 will come back again. For last 1.5 years sightings were low in this zone. Big cheeer! let them grow first, God bless them from movie maker ! 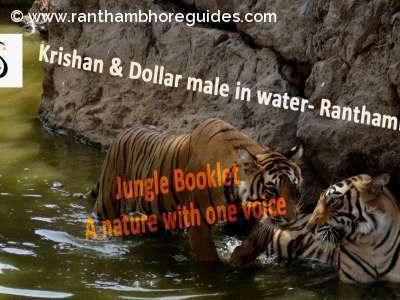 Such a great news from Ranthambhore tiger reserve, we all have been waiting for last summer ! No doubt, Great news for us as nature guides! I hope that If everything goes well, the glory of zone 03 will come back again. Its really very rare incident in the wild life when watching the cubs of 10 days old! God bless them! Every body must care of them while you are on the safari ! VIPs and self proclaim wild life conservators must have far from them! Great news for Park, wildlife, tourists and local people ! Such a big news for wild life ! Wow very small cubs! Jayesh Modak, Sir, I think Chirico aka T-86 is the possible father for them ! Wow Machlis bloodline continues as her grand daughter gives birth to 2 new cubs. Gr8 news I guess Singhsth is the father. I hope he stays around and protects the cubs. Wonderful news from Arrow-Head ! Big cheers!